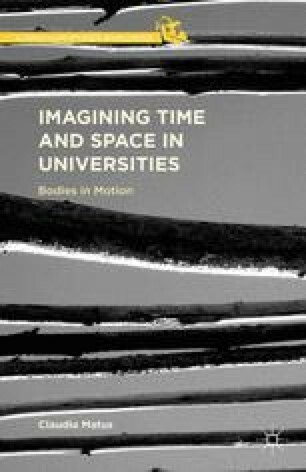 Imagining Time and Space in Universities: Bodies in Motion is a book that questions habitual meanings of globalization and internationalization in higher education institutions. With the abundant attention to internationalization policies and practices promoted by universities, transnational organizations, and national governments, issues such as international movement of students and faculty, internationalization of curriculum, English as a second language, the export of academic programs, among others, have emerged as significant areas of interest. However, the dominant way of addressing issues of internationalization in universities is oriented toward structural, managerial, and administrative dimensions with an emphasis on descriptive elements to facilitate more “efficient” international institutional practices. Yet limited attention has been given to cultural meanings embedded in these institutional policies and practices. This is the gap that this book intends to address. Imagining Time and Space in Universities: Bodies in Motion offers a critical analysis using theories of time and space to understand the implications of dominant discourses of internationalization for the construction of normative ideas of the international body, the revitalization of discourses of nation, the consolidation of notions of progress, the reinscription of traditional performances of gender, and the proliferation of imaginations of the stranger.